This one is highly recommended. And trust us as it's not an exaggeration. 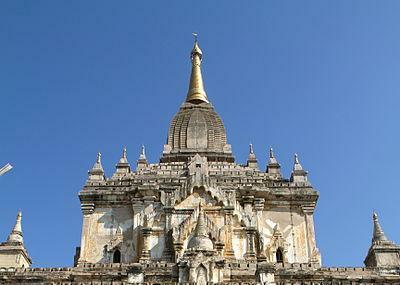 The temple is one of the dozen temples in Bagan and is located amidst some great locales. The view it offers during the sunset is just spectacular and people gather here in huge numbers during this time. If you want to embrace the nature in a perfect manner, then visiting Gawdawpalin Temple is mandatory. The temple is surrounded by an old plaza and a line of trees which make for some pretty pictures. How popular is Gawdawpalin Temple? People normally club together Bagan Archaeological Museum and Ananda Temple while planning their visit to Gawdawpalin Temple. One of the famous pagoda in ancient Bagan, worth to visit Bagan because of it. Myanmar people are so interesting and u should try to come here. The pagoda and the compound are very nice. Cleaned. Really PITY that the wall paintings are covered with lime paint. What a stupid idea. Really heart breaking. Beautiful temple space with gigantic Buddha statues.